Red Miniature Pinscher with uncut ears. Although the Miniature Pinscher and the Doberman are similar in appearance, the Miniature Pinscher is not a "Miniature Doberman"; it predates the Doberman by at least 200 years. The Doberman Pinscher was bred by Karl Frederich Louis Dobermann in 1880, and Dobermann had noted that he was looking to create a dog resembling the Miniature "Zwergpinscher" Pinscher but 15 times larger. The average life span of a min pin is fifteen years. Drawing of a Miniature Pinscher and a German Pinscher (Pinscher und Zwergpinscher), 1888. Historical artifacts and paintings indicate that the Min Pin is a very old breed, but factual documentation begins less than 200 years ago,which leaves the breed's actual origins open to debate. In 1836 (the oldest documented writings on the breed history of the Miniature Pinscher) Dr. Reichenbach[unreliable source?] determined that the Miniature Pinscher was developed from crossing a smooth-coated Dachshund (a favorite German breed of the time with excellent ratting skills) with an Italian Greyhound. Many since that time have speculated as to other possible breed stock but there has been no documentation to support any other breeds. In all likelihood the now extinct Black and Tan German Terrier was used to create many of the German breeds, such as the Dachshund, which has led some to believe it may have other breed stock involvement. However, evidence is lacking, therefore the documented research of Dr. Reichenbach is the only credible source. By introducing the Italian Greyhound to the smooth-coated Dachshund, the result was a swifter ratter more capable to perform the job it was created for by German farmers, which was to rid farms of vermin. It may also be noted that the word "pinscher" in German does not translate to "terrier" as many believe but pinscher in German in fact translates to "biter". [dubious – discuss] The word "terrier", like "setter", pertains to the way the breed works. The word "pinscher" is taken from the English word "pincher" to describe the biting action the breed uses when holding prey, i.e. in a pinching manner. As with all terriers, Miniature Pinschers were bred for the purpose of killing small animals. The Miniature Pinscher is a working breed and not a toy dog as they were first bred to hunt small mammals, especially rats. The Miniature Pinscher tends to have relatively long legs and a small body, which can sometimes make it look quite comical with cat-like grace. As a result of its flexible, agile body, a Miniature Pinscher is able to curl up into almost any position and to almost always be comfortable. Miniature Pinscher breed standard calls for 10 to 12.5 inches at the withers (shoulders) with any dog under 10 or over 12.5 not eligible to be shown. The original Miniature Pinscher actually had more variance as being a cross between a smooth-coated Dachshund and a Miniature Greyhound (known today as the Italian Greyhound) led to some carrying the Dachshund leg while others carried the Italian Greyhound leg creating some short and some tall. After many years of breeding in Germany an average was established, though today's standard is smaller than the original. Germans bred Miniature Pinschers until they could not stand due to small size and frailty, but there was good breeding stock left in Sweden. Gotti, a three-year-old Miniature Pinscher with cropped ears. The coat is short and smooth, with Colors, according to most breed standards, of red, stag-red, and black or chocolate with tan or rust markings, in addition to blue and fawn. Blue coats, while admitted into the UK Kennel Club, can be registered in the American Kennel Club but cannot compete in conformation. The Miniature Pinscher frequently has a docked tail and cropped ears, though the AKC no longer requires ear cropping for shows. The AKC standard specifies a characteristic hackney-like action: "a high-stepping, reaching, free and easy gait in which the front leg moves straight forward and in front of the body and the foot bends at the wrist. The dog drives smoothly and strongly from the rear. The head and tail are carried high." The standard in Europe does not require the high stepping gait as the original Miniature Pinscher did not walk in such a fashion. In Europe and Germany this high stepping gait is considered a fault. The Miniature Pinscher will on occasion carry a small white patch generally located on neck or breast area. This links directly back to the original breed colouring. The Miniature Pinscher once came in merle colouring (in the Dachshund this is referred to as "dapple") and in harlequin like that found in the Great Dane. The white gene is part of the makeup of this breed; though breeders for years have worked to eliminate this gene, it is accepted by AKC in conformation and show as long as the area of white is limited to no more than 1/2 inch in any direction. The miniature pinscher is a loyal dog that thrives on interaction. They are a "family dog". They need to feel involved. Grooming is easy, as the smooth, short-haired coat requires little attention, needing only occasional brushing and shampooing. Care must be taken in cold weather, as the coat provides virtually no warmth. This also pertains to hot weather; with no guard hairs Min Pins can overheat. It is easier for them to be too cold than too hot, they usually do not like air conditioning that is set too low. Miniature Pinschers are prone to overeating and therefore should not be free fed. Their diets should be kept under control. Due to their instinct to hunt vermin, special care must be taken in preventing Miniature Pinschers from "attacking" small objects, such as bottle caps, as these could pose as choking hazards. The breed has an insatiable curiosity, so the best toys for Miniature Pinschers are those that stimulate their curiosity. This may include toys that move or make an interesting noise. Miniature Pinschers enjoy having a collection of such toys, which they will hoard and spend much time in moving from one collecting place to another. 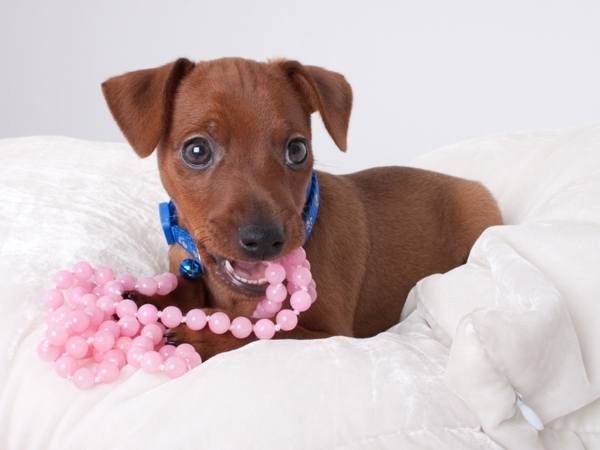 However, Miniature Pinschers will chew and inevitably try to eat their toys, so avoid toys made of rubber or plastic. Rope toys and interactive toys that pose a challenge work well. Cat toys (that do not have catnip) are also suitable. Avoid stuffed toys as these are easily shred and the stuffings will be ingested. Unless it is a dog safe stuffed toy, it is never recommended for a Miniature Pinscher. Miniature Pinschers are territorial, so they should be provided with their own place to rest and sleep, though they will commonly stake a claim to a particular piece of furniture or curtain under or behind which they will sleep when people are in the room. They prefer to sleep on soft objects as well as under soft objects, so a small blanket should be provided so they can nestle. Unless the owner is amenable to sharing his or her bed, bedroom doors must be kept closed at night as Miniature Pinschers will jump onto beds and crawl under the covers. Care should be taken not to accidentally injure a Miniature Pinscher while they are sleeping under blankets. They can easily be trained to sleep on a soft object on a bed. Miniature Pinschers need a medium sized yard. Daily walks are important, as is attention from their owners; a bored Min Pin will become destructive. In addition, when in public the breed should be kept on harness and leash, as it is natural for them to give chase if something of interest catches its eye. Min Pins who are not brought up with children may have a non-malicious problem with them; though not prone to being "yappy", they are natural barkers because of their instinctive protective nature. Care should be taken in educating young people about proper handling and play. The dogs are relatively sturdy for their size but can be easily injured by rough play with a child. In addition, their independent instinctive nature leaves little patience for such rough play. They are prone to broken bones, especially in the first few years of life. They should not be allowed to jump off high surfaces and be monitored when held by children. Additionally, Miniature Pinschers can have luxating patellas, or dislocating kneecaps, and should be checked by a veterinarian for this when young. This can often lead to surgery. A properly bred female to correct size can have up to 5 pups in a litter on average and if proper size has no difficulty in nursing and feeding.